If you wish to place an ad, send us your request by email today. The cost is $150* (plus tax) per ad, and will remain for 90 days. (word document, PDF's or email). 1000 word max. We welcome ads for full time, part time, temp and permanent opportunities. Ads for generalist, specialists & family physicians, locum, hospital and clinic positions. *Inquire about posting rural relevant CME courses to our calendar of events. 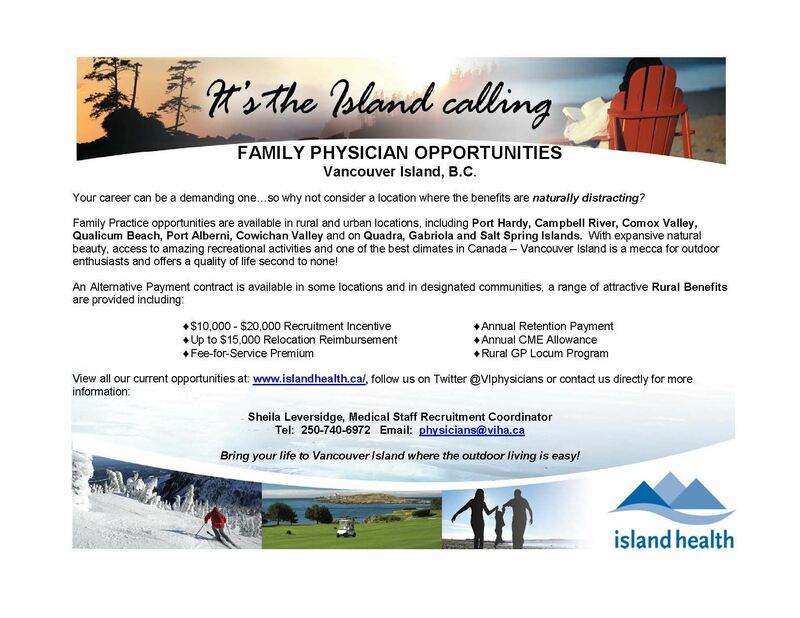 Opening: FAMILY PHYSICIAN OPPORTUNITIES Vancouver Island, B.C. 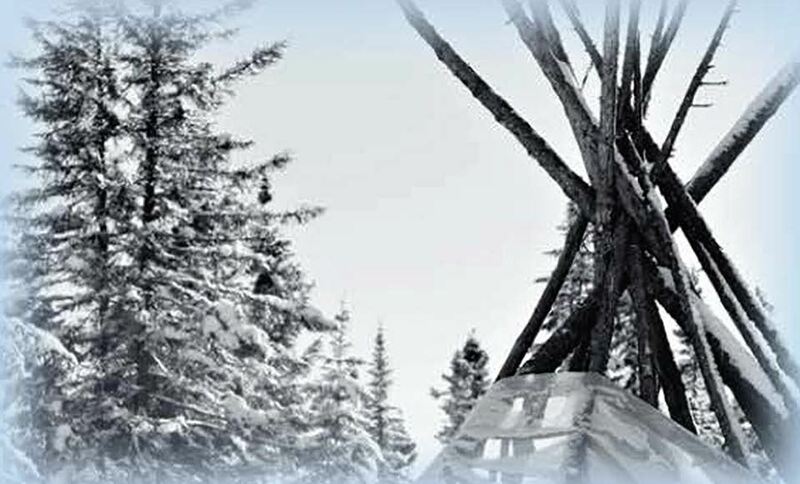 First Nation’s communities along the west coast of James Bay and Hudson’s Bay. Moose Factory, Moosonee, Fort Albany, Kashechewan, Attawapiskat and Peawanuck. 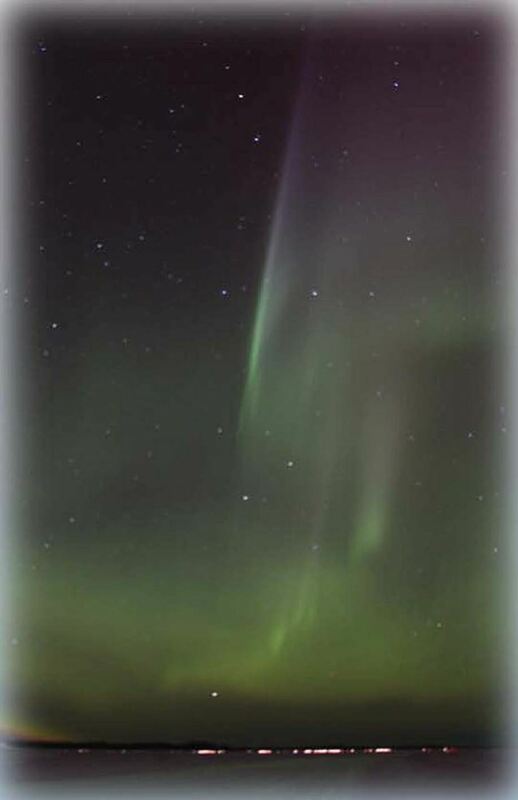 * Housing in Moose Factory provided with all amenities included. One of a network of over 75 provincial community health centres, the NorWest Community Health Centres is a community based, non- profit organization funded by the North West Local Health Integration Network and the Ministry of Health and Long-Term Care, emphasizing access to primary health care, prevention programs and services. We are currently seeking a Family Physician, who as a valuable member of the Community Health Centre team, will provide primary care to clients and their families within a care model which emphasizes health promotion/education and empowerment. Practicing at NorWest CHC’s provides longer appointment times and lower patient volumes than many other primary care settings. We have a team of Nurse Practitioners, RNs, Dietitian, Community Health Workers and Administrative support staff. Longlac is located a 3.5 hour drive from Thunder Bay. Annual Salary at top of our physician salary scale which is equivalent to $137.36 an hour or $962 a day. One paid travel day is included. No on call, evenings or weekends. Thirty five hours a week Monday to Friday. 30 day notice period if for some reason physician or Centre had to cancel the contract. Option for an extension of a month for the locum, if the returning physician from maternity leave decides to take extra time with a notice period of 60 days. Comfortable housing accommodation available close to the clinic. Job Description available upon request. Medical degree and family residency from a recognized university. Current CPSO license and CMPA registration. Experience in a combination of hospital and community settings and/or public health. Demonstrated commitment to and knowledge of community based health care. Sensitivity to the needs of a multicultural community and diverse populations. Ability to work independently and collaboratively in a multidisciplinary setting. Ability to work effectively with marginalized and under serviced populations. 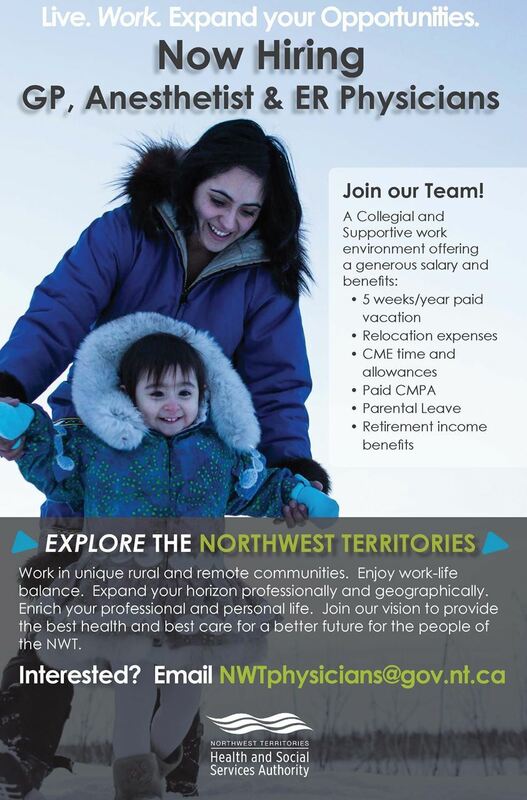 We have opportunities available in our beautiful mountain community of 6000 people in southwestern Alberta. This involves a clinical office practice with great staff, collegial environment with evidence-based practices. Physicians also staff the local 24/7 emergency department, manage inpatients/obstetrics, long term care, and also work with an active surgical department. Located 1 hour and 30 minutes from Lethbridge and just over 2 hours to Calgary, Crowsnest Pass offers the best of small town living with ease of access to the amenities of the big city. Living and working in Crowsnest Pass provides an abundance of recreational and lifestyle opportunities. Within the townsite, Pass PowderKeg ski hill offers a family oriented downhill skiing opportunity with unparalleled convenience. Access to two world class downhill ski hills (Castle Mountain and Fernie Mountain Resort) are both within 45 minutes, as well as 30 km of track set cross country ski trails just outside of town. This area also has easy access to an abundance of snowmobiling in Alberta and just across the border in British Columbia. Crowsnest Pass was awarded the top choice for Favorite Overall Snowmobiling destination in Alberta in the. In the summer, access an incredible network of mountain biking, scrambling, and hiking trails provide plentiful opportunities for getting outside. World class fly fishing is just out your backdoor on Crowsnest River and Castle Provincial Park beckons to be explored! With a younger population moving into town for more affordable living conditions this area has a great deal of potential and opportunity for growth. Winter or summer, this area has plenty of opportunities for families or individuals with their eyes set on outdoor adventures. Crowsnest Pass plays host to the locally developed Sinister 7, a 100-mile ultramarathon race with over 1500 racers and full compliment of volunteers. Or, challenge yourself to Meet the Minotaur with a mountain race that will test your physical and mental toughness. After the race, drop by the newly renovated outdoor poor for a refreshing swim! The United Riders of Crowsnest (UROC) have created an active community of involved mountain bikers that are engaged in community development and enhancing access to a multitude of mountain biking trails located within Crowsnest Pass. Their Bootleg Bike Fest has become popular with locals and tourists alike and is now a stop on the Norco Canadian Enduro Series. The Mountain Spirit Festival celebrates all the best parts of living in the Rocky Mountains through outdoor adventures, art, and culture exhibitions. Dating back to the coal mines of the early 1900s, this area is a hub of eclectic history and stories. The Frank slide Interpretive center offers up spectacular views and an informative discussion of the 1903 rock slide that buried the old town of Frank. This slide is visible from the road and in some areas has become a must visit destination for climbers and boulderers. The Crowsnest Pass Museum offers up relics and stories of the area’s eclectic and sometimes scandalous history. During prohibition, this region was a hub of run running that made for some fascinating tales. The Crowsnest Doors Open and Heritage Festival provides a fun opportunity for the whole family to explore the unique culture and history of the area. Office practice currently consists of 10 general practitioners committed to full scope practice with a dedicated staff team and integrated with the Chinook Primary Care Network (CPCN). The clinic was built in 2016 and provides a bright and spacious working environment. Energetic group of like-minded physicians that value strong clinical skills along with a desire for work-life balance. Renumeration for services in hospital and clinic are through fee for service billing, but supported by a contractor billing team to make it easier on everyone. As a rural community, billings are supplemented by a 15% top up through the Rural Remote and Northern Program, in addition to Alberta’s Business Cost program and Medical Liability Reimbursement Program (Brings CMPA costs to $1000/annum). The Crowsnest Pass Hospital is a 17 -bed hospital serving several surrounding communities with strong winter and summer tourism opportunities bolstering the local population. The hospital has full time pharmacy, social work, physiotherapy, occupational and recreational therapy support along with an amazing team of care providers. Emergency call is supported by local on call surgical and anesthesia backup, as well as on call specialty services at Lethbridge Regional Hospital and in Calgary. 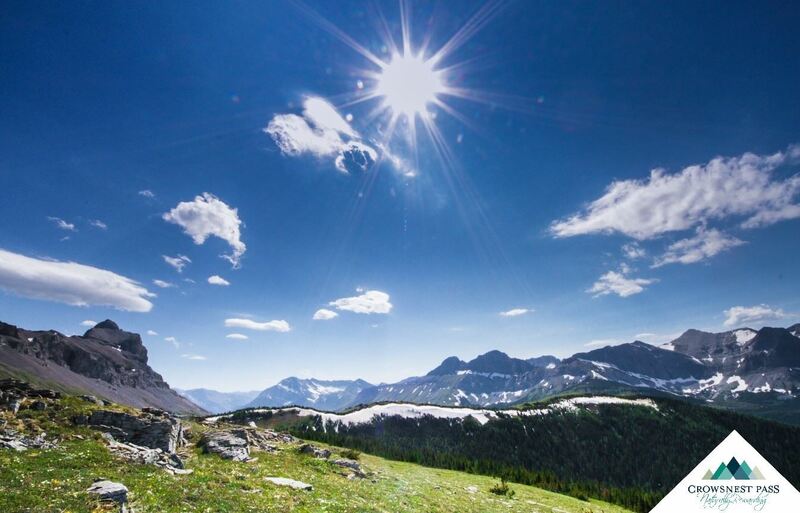 Consider the opportunities Crowsnest Pass has to offer you as a spectacular community to call home. ©Copyright 2017 - The Society of Rural Physicians of Canada - All Rights Reserved.